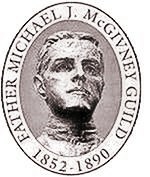 The Knights of Columbus has established a Guild to advance the cause for canonization of our founder, Father Michael McGivney. The Guild gathers evidence on Father McGivney's life and character, collects information about favors people have received as the result of Father McGivney's intercession, promotes Father McGivney's cause for canonization, and offers spiritual benefits to its members. Click here to join the Guild and you will be able to receive the bimonthly newsletter and be informed of the progress of Fr. McGivney's cause for canonization.